Hematomas are caused by trauma which can become a persistent infection or from an injury such as occurs in a dog fight - here's photo, do it yourself help. Hematomas are caused by trauma which can be chronic as in a persistent infection or it can also result from injury such as occurs in a dog fight but here's how to treat a hematoma. The question then is what to do about a hematoma, specifically on the ear. It is among the most frequent reasons for veterinary visits. 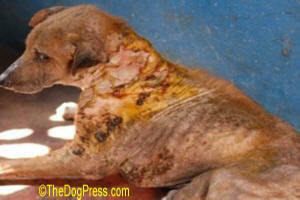 With nearly eight decades of living and working with dogs, I’ve dealt with many such cases. 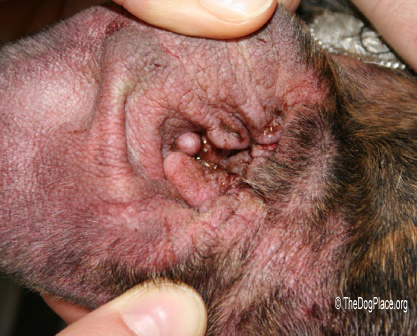 The usual veterinary approach is one of anesthesia and considerable cutting but practical experience has taught me there are other ways to treat hematoma. I always opt for minimally-invasive methodology. 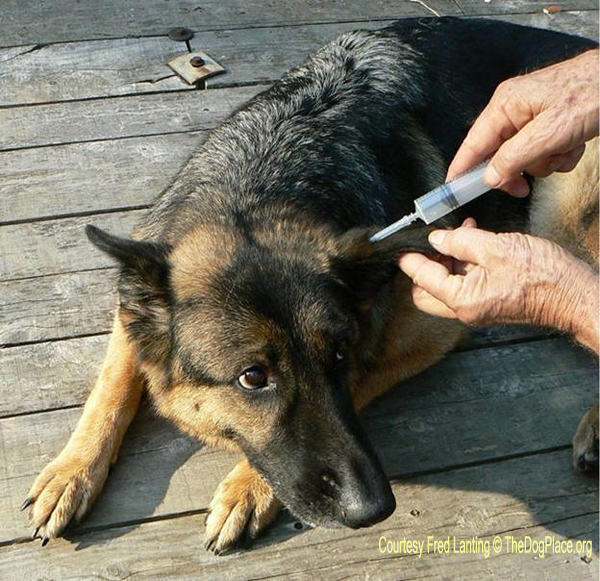 Instead of the slice-and-dice approach that most veterinarians still use on the ear, my do-it-yourself solution requires only a large-bore hypodermic needle and a relaxed patient. If you have failed as a “doggy-daddy/mom” to train your pets to quietly lay still while you take care of their problems, then you deserve to have to help pay for the vet’s Cadillac. The ear can be thought of as two layers of skin “pasted” together. Imagine what your arm would be if it had no bones or muscle, and practically no fat or blood vessels. It would be like a postal envelope before you put things in it and seal it. Well, that’s how you should look at the ear: two layers—an outer and an inner—with so little between them that you normally don’t think of it as an envelope capable of being puffed open. Of course, there are blood vessels in the ear flap but they aren’t given much thought until something happens. That “thing” that happens so often to dogs is hematoma, a trauma severe enough to cause rupture of some of the circulatory system’s vessels. Most people think of veins and arteries but there are also lymphatic pathways, and in my experience, hematomas often seem to have had as much lymph (a clear liquid) as they do corpuscle-containing red blood. There are several causes of hematomas, ranging from scratching at ear mites or crud, to vigorous shaking water out after swimming. This is more common in hounds and other drop-eared breeds. If the bleeding or weeping into the inner layer of the ear flap is sufficient, it will cause a fluid-filled sac that could swell until it reaches the point where the “leather” will not stretch apart any further. Since blood coagulates after it leaves veins and capillaries, it is extremely important to treat the problem as quickly as possible after the trauma has occurred. The longer you wait, the longer it will take to treat it, and the lower the probability of satisfactory success. The object of treatment is to return the ear to its original, closed-envelope condition, and to do that you must remove the separating force—the liquid—so that the two pieces of outer and inner skin/integument can again be intimately closed. The accompanying photo shows the “aspiration” procedure, with the needle inserted only far enough to reach the liquid and at such a low angle that it does not go all the way out the inner surface of the pinna (shell or flap). In the photo, you see I am using a large-capacity syringe to pull fluid from the ear hematoma. This is not necessary unless you have no choice but to do this operation on a surface that you want to protect from bloody stains. If you do it on a vinyl floor, outdoor deck, or someplace where you can let the serum flow, or have plenty of towels to catch the liquid, you can do without the syringe, and just use the needle alone. If you need to fill more than one syringe, leave the needle in place and close it off with a finger while an assistant empties the syringe so you can reattach. That would be better than multiple puncture sites, since every puncture slightly increases the possibility of inserting a few more germs into the ear flap. And that brings up infection risk and skin preparation. You’re probably thinking of all the shots you’ve had, with the nurse scrubbing the site with alcohol or betadine to “sterilize” it before stabbing you. In my many years of giving injections and drawing blood, I have never found it necessary to do more than find a location that was not totally caked with filth. In fact, there are some who’d say that such “prep” merely stirs up the germs, and that the entry wound made by a needle in a spot that looks clean is not going to carry enough of anything into the body to worry about. I have never caused an infection at an injection site with my careful but non-sterilizing method. But different strokes for different folks, so do what your own experience and common sense tell you. If you've waited a little too long to drain the hematoma you may find that there has been scar-tissue building up and so much clotting and/or infection that removal of the semi-coagulated liquid is difficult. If this is the case, you may have to readjust the left-to-right angle of the needle, or the depth to which it is inserted, or even perhaps find a nearby site where the lump feels more liquid. You may also have to press the two pinna surfaces together so as to squeeze the thickened serum into the needle. This could lower the chance of full success leaving a lumpy or crinkly area. A show judge or casual admirer might not notice the difference in a long-coated Retriever, but it could be very obvious in a GSD or Ibizan Hound. If you have a down-ear breed and your dog shakes its head a lot as if to try to remove something, check it for hematomas, ear mites, foreign bodies, or wax build-up. If a lot of wax is there, that could be a sign of something else, so look further for the causative factor. If there is also a rancid odor, you could have a dog with an immune-system problem, perhaps caused by genetics or too much and too frequent vaccine use. If your dog swims a lot, head shaking to get water out of the ears will only be very temporary, not chronic. Check ears frequently though, as some diggers collect a lot of dirt. An occasional cotton-tip stick or even your little finger wrapped in toilet paper should keep most ears clean. Most of the dogs I’ve performed this puncture-and-drain ear hematoma technique on were German Shepherd Dogs, my main breed. If a more invasive surgical approach as is used by most vets is taken, it may result in a floppy, poorly-carried ear that greatly detracts from the dog's appearance. This is especially deleterious if your dog of an erect-ear breed is in conformation-show competition. Remember the basic principle that applies to almost all aspects of life: try the simplest applicable remedy first and then if that is not sufficient, take a more complex or invasive step. Treating an ear hematoma, if done early, is a simple procedure. We worry about viruses but bacteria is a much more deadly threat. 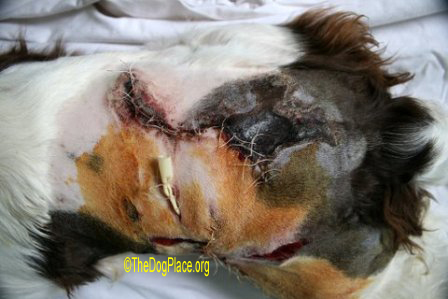 Flesh eating bacterial infection, started with a vaccine shot. What are the chances you or your pet will get the MRSA bacteria?